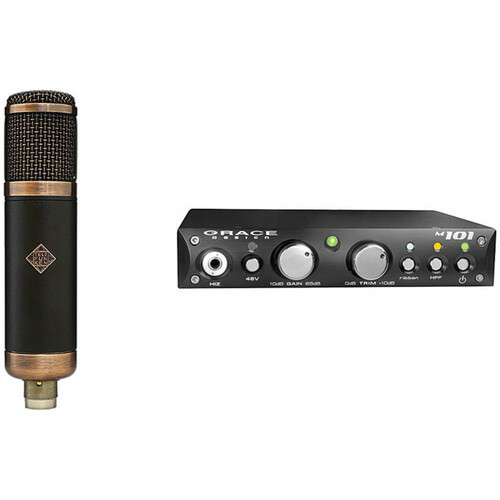 The Telefunken CU-29 Copperhead Microphone + Grace Design M101 Preamp Bundle is a B&H Kit that pairs a hi-fidelity microphone with a fully balanced, transformerless, single-channel microphone preamp with optimized DI instrument input. The CU-29 microphone delivers clarity and detail and displays a "present" character, while the tube output stage adds warmth and a wide frequency response. The Grace Designs M101 provides a superb pairing to the microphone with a fast, musical transimpedance amplifier architecture that also delivers a clear and detailed signal. The m101 from Grace Design is a single-channel microphone preamplifier that uses the same fast, musical transimpedance amplifier architecture as the model 801 and model 201, but packaged and priced to be within the reach of any recording engineer, musician or studio. The preamp now employs 0.5% precision metal film resistors. An upgrade from the model 101, the unit still employs fully balanced, transformerless circuit topology and has no electrolytic capacitors in the signal path. With incredible bandwidth, headroom and resolution, the unit is remarkably natural, musical and detailed. A universal power supply is internally mounted. The m101 features a ribbon microphone mode which provides additional gain that is usually required by that type of microphone. Pushing the dedicated ribbon switch does three things. Phantom power is locked-out to prevent potential damage to ribbon microphones, the impedance of the microphone input is raised from 8.1kΩ to 20kΩ, and the 48V DC blocking input capacitors are bypassed with sealed gold contact relays. The included instrument DI input is designed to accommodate a wide variety of high impedance input sources, making the unit an excellent choice as a DI box which will flawlessly preserve the sound of any plugged-in instrument while imparting lackluster sounding instrument pickups with clarity and detail. Box Dimensions (LxWxH) 16.4 x 14.2 x 4.7"
Does this come with the shockmount?